In the summer of 1781 Mozart described his new home Vienna as "the land of the piano". He soon set about presenting his own subscription concerts, offering the three newly-composed concertos on this disc for publication "either with a large orchestra or a quattro". 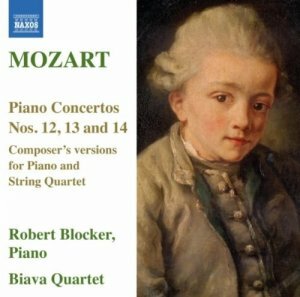 The latter, more intimate versions of these charming works are performed here by Robert Blocker, Dean of Music and Professor of Piano at Yale University, and the youthful Biava Quartet, winners of the Naumburg Chamber Music Award and top prizes at the Premio Borciani and London International Competitions.